Quartet bulletin boards come in an array of sizes and shapes and are ideal for communication board ideas in the workplace. Life can get very busy particularly within the workplace, and it certainly helps when schedules, notes and chores can all be managed in one convenient place. The workplace always has constantly changing to-do lists, and with the help of some creative workplace bulletin board ideas it will make for a much happier atmosphere within the office. Bulletin board themes can easily be created on the magnetic fabric bulletin boards that come with magnets and ‘quick clips' to hang documents and pictures from this metallic fabric. The hanging system bulletin board can be attached to a cubicle or wall. 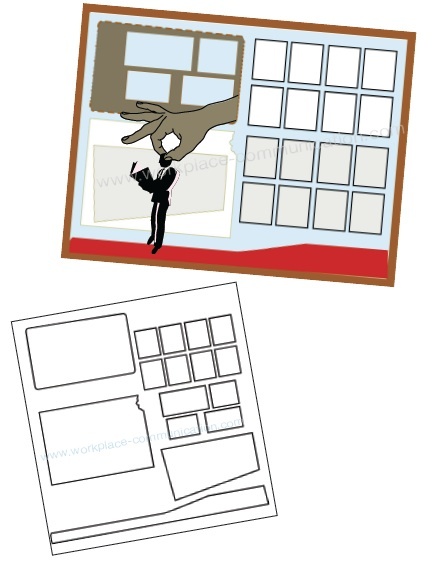 Wall mount: basic bulletin board that involves a single sheet of poster board (or other material) being mounted to a wall. Sandwich board: this is generally thought of as an advertising prop worn by an individual, but many bulletin boards employ this A-shaped design. Can be placed on the desk or floor. Light box notice board: fluorescent light fixtures are the usual feature in these modern bulletin board shadow boxes. This means that you will have an automatic highlighter that will draw attention to your postings. Day or night-viewers will see and read the content that you have made available. Banner style roving notice board: with banners you will surely get more attention because of the natural movement and appealing visual effects. Perspex holder notice board: memos and notices are placed between two sheets of perspex material and then can be circulated, posted or mounted as desired. Hanging notice boards: the memos and other contents that need to be posted are allowed to drape naturally from the bulletin board instead of being bonded to the board. Full wall length notice board: large bulletin board that is designed to capture the attention of viewers. Cube notice board: box shape that is generally positioned around a column or pillar . Simple construction includes 4 panels with plenty of available room to post messages, information and updates for the office staff. Today there is always a great deal of information, memos and other minutiae that affect the daily routine of the workplace. The best and most cost-effective method to keep fellow workers updated and ‘in the loop' is through the use of bulletin boards. Inform members of your office and staff of upcoming events or new developments by posting the messages and information on a bulletin board that will be seen by each individual. Draw attention to changes, new guidelines or updates with bulletin board postings. You can even employ a bulletin board to help you motivate your entire team to pull together as one cohesive unit.